Equip and customise your personal mech! Mech Assembly Station is a specialized station for equipping mech components to player mechs. Components can be crafted at a Mech Part Crafting Table, then slotted into the appropriate slot at the Mech Assembly Station. Both the Part Crafting Table and the Assembly Station have a permanent placement underground, just east of the Outpost. As pieces are slotted in the total energy and energy usage rate will adjust, as well as the mech appearance. There are two color pickers underneath the Assembly diagram -one for the main color of the mech, and one for accent color. These options will recolor all mech parts together, making the entire mech color coordinated with the selected options. Any swapped in mech pieces will automatically color adjust to the selected color palette. The only optional component are horns. If there are any other types missing the 'Ready to Deploy' message at the bottom of the window will read 'Configuration Incomplete' and the piece slot will be highlighted red. An incomplete mech build cannot operate, and will not display energy/energy usage. Apex : With this station I could assemble components into a working mech suit. Avian : This station is made for piecing together large mech vehicles. Floran : Floran could make big mech with thisss station. Glitch : Astonished. This advanced assembly station is designed to make mech suits. Human : This station is for building and outfitting mech suits. Hylotl : This terminal is for customizing and outfitting mech vehicles. 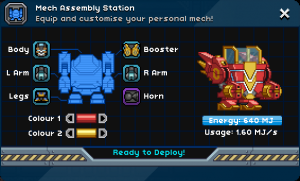 Novakid : This station'll let me put together a mech any way I like. This page was last modified on 5 June 2017, at 11:57.